It is rare that we can announce the coming of the fairies. But here they are, some thousands of fairy folk, in over 400 reports from around the world. In this age of the Internet as the source of all knowledge, forteans are hungry for new material. That is one reason we should be sounding the fairy pipes for the publication of this extraordinary collection of first-hand reports of fairies, not only from the dim past, but from the 20th century and from ordinary people just up the street. Well, primarily up the British and Irish street, although there are stories from the British Dominions as well, and a very few from the United States. This unique assemblage of fairy sightings is essential reading for forteans, folklorists, fairyists, and, in fact, anyone who researches the unusual or the psychology of those who report the anomalous. The collection was rescued from obscurity by the assiduous work of the editor, Simon Young, who writes on folklore and history and runs www.fairyist.com. We owe him a debt of gratitude for rediscovering Miss Johnson’s manuscript and persevering through many vicissitudes in having it published. As his introduction tells us, the collector and author Marjorie Johnson, a former secretary of The Fairy Investigation Society, spent decades in search of a publisher. Ultimately it was published, in Germany and Italy, in languages Miss Johnson could not read. Young located the English version of the manuscript with Miss Johnson’s heirs (she died in 2011) and presents it here, along with a brilliant introduction which comments on the changing themes in fairy lore, the role Theosophy played in transforming fairies from dangerous entities into benign, tree-hugging nature spirits, and the cast of characters surrounding Miss Johnson and the Fairy Investigation Society. The FIS attracted eccentrics, Theosophists, Spiritualists, and cranks. But it also had members like Capt. Quentin C.A. Craufurd, formerly of the Royal Navy and president of the FIS, and Air Chief Marshal Hugh Dowding, commander of RAF Fighter Command during the Battle of Britain. Sightings by members of the FIS form much of this book. Young, in a footnote to his introduction, suggests that the question of when fairies acquired wings is one that needs to be studied in more detail. Perhaps the question of fairy wands needs to be added to the list of fairy mysteries. While Miss Johnson collected many traditional fairy sightings, it is the outliers that are most fascinating: the “working-party elves” who wear Wellingtons; the cobbler fairies in leather aprons accompanied by the sounds of hammering; a Cornish lady pixie covered with short hair, like a horse; and several fairies wearing medieval headdresses. There is also a miniature “admiral of the fleet,” which reminded me of James Thurber’s account of seeing a little admiral riding a bicycle alongside his car. The elaborate fairy scenarios seen by Mrs Longuehaye sound much like the complex visual hallucinations of Charles Bonnet Syndrome, a diagnosis which can by no means be proven, but which has to be taken into consideration when looking at cases of this kind. A Mr Charmon was interested in what he called “elementals” and reported seeing some grotesque and fragmentary figures. Distorted and partial images are a feature of Charles Bonnet Syndrome, but Mr Charmon gave a Theosophical explanation: the elementals were not developed spiritually so they were physically incomplete. Witnesses to a good number of the sightings mention that they “received the impression of” the entity, or that the fairies were seen with the “faculty of extended vision,” or some other sort of psychic sight, rather than with the eyes. A high percentage of the sightings are also made in the bedroom, at the time of going to bed or waking up. They may not be classic “bedroom intruders,” but that is a factor that must also be weighed in examining these reports, as well as the possibility of hypnagogia. In the jacket blurb written by Miss Johnson, she asks only that the reader peruse the book with an open mind. However, Miss Johnson believed in fairies—she and her sister had both seen them–so it is not unexpected, but a little disconcerting, to find statements like “the answer, of course, lies in the work of the group spirits,” in response to a question about animal homing instincts. 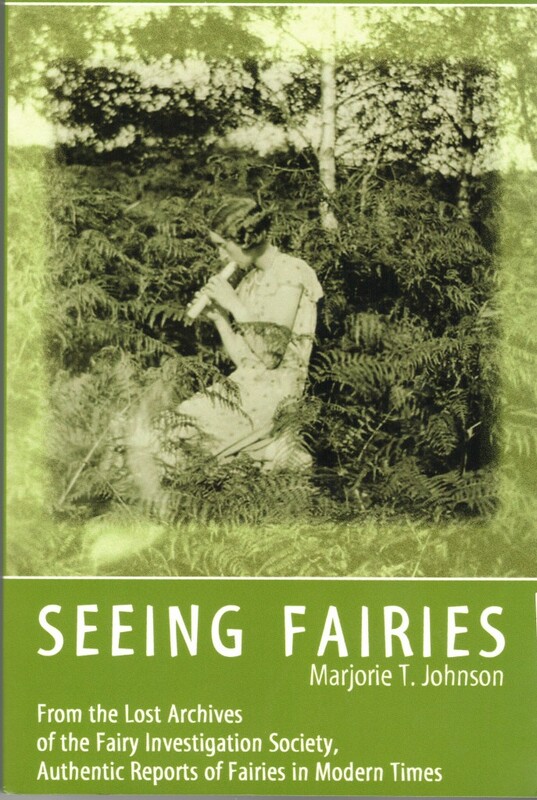 Miss Johnson’s belief in the helpful nature of fairies is plain to see throughout, but it should in no way detract from the value of this superb collection of witness reports. Miss Johnson also makes a spirited defense of Geoffrey Hodson, who became involved in the Cottingley Fairies affair and expresses her frustration with the conflicting statements and rumors surrounding the case. Some other themes in the book include: rainbow colors; the wings vs. no-wings debate; “different frequencies” mentioned in relation to the fairies’ planes of existence; the healing powers of fairies; their protective relationship with nature, animals, and plants; their dancing; the ubiquitous sound of fairy bells; and an almost obsessive preoccupation with fairy costume. There is a certain amount of shape-shifting or the implication of shape-shifting in these fairy accounts. Witnesses may believe that they are seeing something normal, when suddenly their eyes are opened and fairies appear instead. For example, one witness saw a bush full of glow-worms which turned into gnomes. Another saw what she thought was a dragonfly, but was really a fairy. These dragonfly-like fairies appear in several reports. This is a book perhaps best dipped into rather than read cover to cover; narratives vary from a paragraph or two to several pages. There are some gems here: The section titled “Fairy Glamour,” on “pixie-led” incidents is outstanding. These stories, to my mind, are some of the strongest portions of the book. I was also enchanted by the description of a fairy trotting race, complete with tiny horses and traps in the chapter dealing with the gnomes of Woolaton Park. The chapter on fairy music contains some striking and illuminating stories. What are we to make of a rock that pours out exquisite music? My vibrations are less in sympathy with the Theosophists’ stories of jelly-like elementals and reports on the Devic Guardians left me murmuring, “Madam Blavatsky has much to answer for.” I do try to keep an open mind, but when someone associated with an organization called The Aquarian Metaphysical Institution of Colour Awareness starts telling angel stories my eyes begin to glaze over. More interesting are the straightforward accounts, which form the bulk of the book, of a housewife’s brownie vision or a soldier’s gnome sighting. Theosophical talk of “higher planes of being,” “etheric beings,” nature regeneration, and fairy sanctuaries may prejudice some readers against what are genuinely interesting accounts of peoples’ experiences. The book would have benefited from an index, so that reports could be charted by location. If there were fairies at the bottom of your garden, wouldn’t you like to know? Whatever we call them, and whatever guise they wear, it is fascinating to see the points at which the worlds of the fairies and other supernatural entities intersect. The reports in Seeing Fairies add to our knowledge of paranormal patterns, which perhaps may, someday, solve the mystery of fairy sightings.